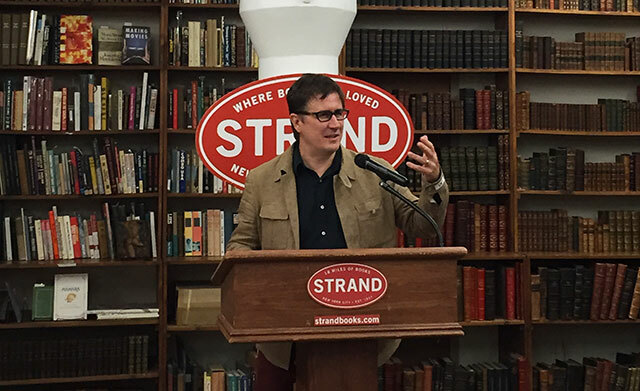 Novelist and musician John Darnielle was at The Strand last week to promote the paperback release of his critically acclaimed novel Wolf In White Van. The room was packed with Darnielle fans. Though unclear whether these devotees came admire to Darnielle through his band the Mountain Goats or his book, all seemed well versed in the novel. That question of how readers come to their work often seems to preoccupy literary novelists who publish after finding celebrity through other means. Danielle appears he is no different in his concerns. Questions about his band are off putting to him, and he has to reiterate to the audience that he has been writing for a long time, almost as if he worries they don’t quite believe the musician they worship has also written a novel. Wolf In White Van takes place in a world without the Mountain Goats, Darnielle explains to the audience when they ask whether his characters would be fans. He adds that he dislikes talking about himself. Danielle reads two selections, one a portion of the novel that was cut before publication when the book had multiple narrators. Early drafts had many other people speaking, but eventually he realized they needed to be culled. The seed of an idea for the novel came to Darnielle while he watched Dream Deceivers, a documentary about Judas Priest, an old style metal band. The band faces a lawsuit after teenagers shoot themselves in the face, citing the lyrics played backwards as the reason they did it. One boy survived to testify. “Its a hard documentary to watch,” he says. The idea of listening to lyrics backward intrigued him and he started a writing exercise one morning because he had nothing else to do. He says then this thing happened where he knew he had to figure out the rest of the story he had created. The novel evolved from a series of questions: if he had a character who was severely disfigured, when and how would he live, where would he work–and then the idea of a mail order game came to him. He says until he wrote the book, he didn’t know the mail order gaming community existed. Now he says he has a regular game night with friends. Though people are often desperate to hear how fatherhood has impacted his work, Wolf In White Van was written well before he was one. He jokes about memoirs written by new parents saying that doing something for two years doesn’t make someone an expert. Writing novels is very different from writing music. Its highly technical, he says, without being performative. The book took five years to write. He can write a song in an afternoon. Song writing is also hugely collaborative. With the book, he wrote it and sent it to an editor. “I’m Catholic, so I need approval,” he jokes. He says that his goal is to write characters that are neither sympathetic nor unsympathetic. Real people are more complex than that. “I don’t think characters or narrators need to be odd,” he adds. Writing he says, is never completed, it is only abandoned.